Took Sachis Justin to a friends new pet store location while I helped them to paint and get ready for opening. He hasn't had any crate time and I thought this might be an opportunity for him to get some crate time and meet and greet lots of animal people. He was a hit!! Everybody was around his crate talking to him.Nobody painting!! Then when it came time to go for a walk it was funny to see how many people were ready to do it. Four hours and four walks and he was so good. Lots of pictures being taken on cell phones and sent to friends. He will be ready for his debut at Andys on Saturday. by Tracy Hon. Right now I am a little frustrated and disappointed. 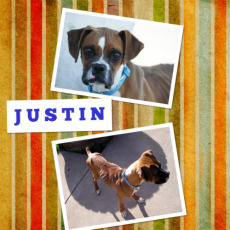 Frustrated with the potential adopter and disappointed for Justin. The first comment that she made when she met him is his nose is awfully long and oh my look at that tail it is cut too long also. It went downhill for me from there. I had expected a lot of things but not that. I sent photos she knew everything I knew about this pup. 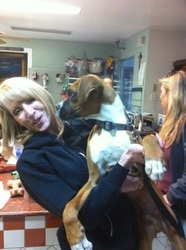 She fo...sters for another boxer rescue group but they didn't have a dog that would fit in her home. I guess I should have read between the lines. The other group had pups but all were questionable as to whether or not they were purebred. Then she made a statement that she couldn't understand rescues saving dogs that had health issues that cost a lot of money and the clincher she thought they shouldn't rescue whites. Well, that was the nail in the coffin. I was talking to a potential adopter who had the mentality of many breeders. She wanted to know if he would potty in the house, well yes if he was left in too long without being taken out he would. I was glad when she left because at that point we were in the backyard and Justin was being polite to her dog and affectionate to her but she said "there was no connection" to him and what did I think that meant. I wanted to say it means you think his nose and his tail were too long and that was that but I didn't. It is what it is. Apparently she isn't going to get a dog from me and Justin deserves a better home than that. So Sachi he is still available. 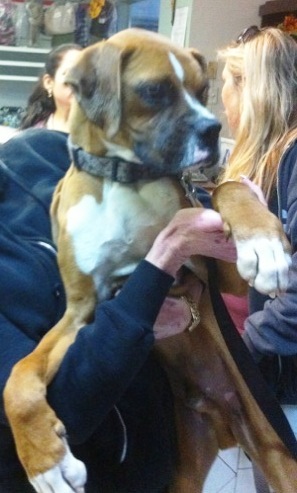 He will just become better and better and someone is going to get a really great boxer pup. will put on some weight and I can't quit coming out in the morning to a pen full of poop, which is on the bed all over the floor and of course Justin. The concrete in his sleeping pen is lighter than the rest of the floor from being mopped and sanitized so much. time. He needs more interaction with people at least a lunch visit. Pictures to follow. but the Annie not so much. Next Tuesday he is spending a play day at a friends who has cats so he can used to them too. He had some worms so gave him a wormer and he will gain weight now. 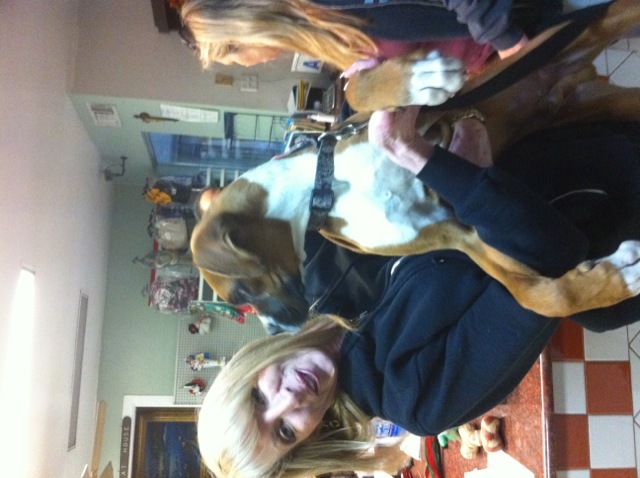 He is started on Heartworm protection and so he is so ready for a home. pictures of him tomorrow. Don't wait for this boy when he is "discovered" he will go quick. me an opportunity to be a small part of his journey to a new and loving home. will be the best for him. He has calmed down a lot and is getting accustomed to the life here. He is a quick learner and a lover, good combination. Tracy Hon Poor little Justin. He is such a sweet boy. All he can focus on is food. I am feeding him five or six times a day with the dry food and keefer for his stomach. When he gets nervous he starts licking his lips, chewing on his tongue and teeth chattering. It must have been hell for him before he was found and rescued. He doesn't know how to play or what toys are. He had a modified bath today. He smells better and he seemed to enjoy it. He paces back and forth from the open back door to me on the grass. He is worried he won't be allowed back in. he knows that he can trust them. After being hospitalized for quite some time, a very thin and exhausted JUSTIN was sent to an experienced foster, TRACY HON. ended up in the Bakersfield shelter. I can't imagine a baby being left on it's own to survive off the land. It is so lucky that he didn't end up eaten by coyotes, hit by a car, or with a disease from which he could not recover. We have had Justin for almost 3 weeks, and he has been at St Francis Animal Hospital his entire stay. He was on IV for about a week. He was extremely sick with kennel cough and diarrhea. He was very dehydrated. But our strong willed Justin has come through and is doing well. 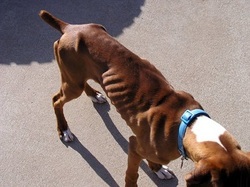 Justin is still very skinny and we are working to get some weight on him. He is a sweetie pie. He is just a puppy who wants to play all day.